For any faithful followers of my blog, sorry to be away so long – I have been busy working and travelling. 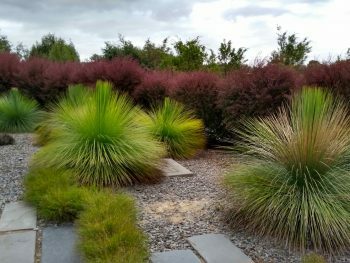 I’ve just visited a great botanic garden with a fresh modern design: the ‘Australian Garden’ of the Royal Victoria Botanic Gardens, near Melbourne, Australia. The garden manages to display plants in meaningful groups – families, or habitat, or interest – in ways that can intrigue and interest everyone, and become a great exploratory day out – as evidenced by the many families I saw there. It’s set in a larger park of native bushland, and it’s free to enter. The traditional custodians of this land are the Boon Wurrung people of the Koolin Nation, and they are acknowledged as such by the Royal Botanic Gardens. Nearby is another small hill with a dramatic rock face descending to the water and great slices of rock protruding at intervals. The tree above came from a front garden, after floods caused the tree to swell so much it became too big. Lastly, the garden’s centrepiece is the Red Sand Garden, with the vibrant deep red sand of the Australian desert, dotted with planting of acacia and spinifex, and flat curving sculpture. If you’re in the area, I recommend this garden as a way of finding out more about Australian native plants as well as an enjoyable outing.